We’ve been talking about what we don’t like about, or in poetry, and while I’ve been doing lots of great reading on the subject (Here is a little more on Moore’s Dislike), I don’t want to dwell here too long, but instead want to soon move on to what we love about it, what sets us on fire, in that good and passionate way, not in the incendiary painful way. So just one more night I will stop here and look at the negative, as Billy Collins says, “The Trouble with Poetry.” Now some critics in the last decade have said that Billy himself was part of the trouble, but the more I read him the more I realize there is a lot going on under the surface. Here is a good discussion of that regarding Billy and the Trouble, or troubles with poetry and the writing thereof. And here is a wonderful six minutes or so of Billy being interviewed on NPR about this book and its poems. In the poem itself Collins seems to say the trouble with poetry is that it inspires the writing of more poetry. Listen to him reading during this live out door performance. To keep you from being distracted by the background noise, open up the text in a new window by clicking here, so that you can follow along. *EDIT: Since for some reason embedding is disabled, you’ll have to click on the link below to watch the video. Sorry for the inconvenience. Previous Post Even Marianne Moore disliked it. Collins doesn’t actually seem to have any problems at all with poetry (I mean, is the desire to write more poetry a real “problem”? ), but if we are to take his complaint somewhat seriously, he seems to be saying that needless and excessive masturbation is the problem, but that could be said of any art (including the art of masturbation). The problem with his problem, though (if we’re to believe him), is that thousands of years of poetry have not run the well dry, and the only reason we know this is because people continue to write. And sure, tons of amateur blogs have shown us that a lot of that writing is self-stroking, at best. But everyone has to have their chance, because a few of those people are going to be pretty good, and the best stuff rises, eventually, above the sinking debris. So bring on the bad and bring on the good, and let natural selection do its work. I like Billy Collins’ poetry – and that poem in particular. I find his poetry accessible – and yet does have depth for the second and third read. He is one of my role models – and I try to write poems that do the same. I want people to read my poems and “get it” on the first read, but I want there to be more there for them to discover if/when they re-read. Thanks for the links; I also liked the article at the Poets Online blog. 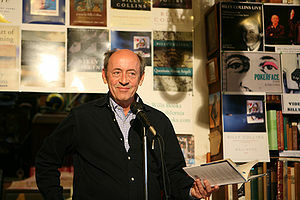 Oh, Billy Collins is one of my heroes. I have a number of poems of his that I recorded on YouTube. I think he’s a modern master whom a lot of “serious” poets don’t take seriously enough. There’s a lot behind what seems like a simply wisecrack with him. I just read the book today at the library, my first Collins read, and I will say, it’s a good book. Great to hear! I’m glad you like him. He’s one of my favorites. The poem strikes me as very tongue in cheek, not a complaint about poetry but a celebration of it. It’s sort of like how the trouble with cookies is that you can’t eat just one, except that poetry blessedly doesn’t cause weight gain. I think this is a great interpretation. Thanks! 🙂 I have been saying that there is a lot more going on underneath a Collins poem. I think he’s poking fun and celebrating at the same time. I like the cookie comparison. I’m not a fan but understand the possible misunderstandings in how poetry can proffer us~ Thanks for putting so much effort in your wonderful posts!